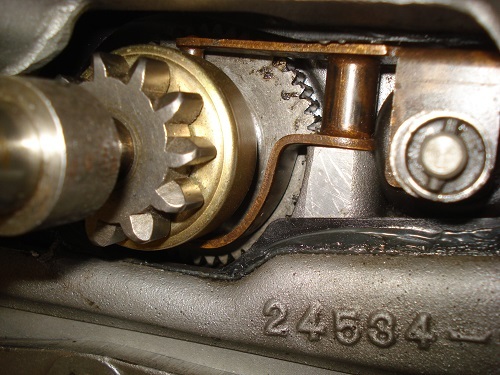 The bendix-type gear, also referred to as the starter drive, is located in the starter housing between the starter motor and clutch ring gear. 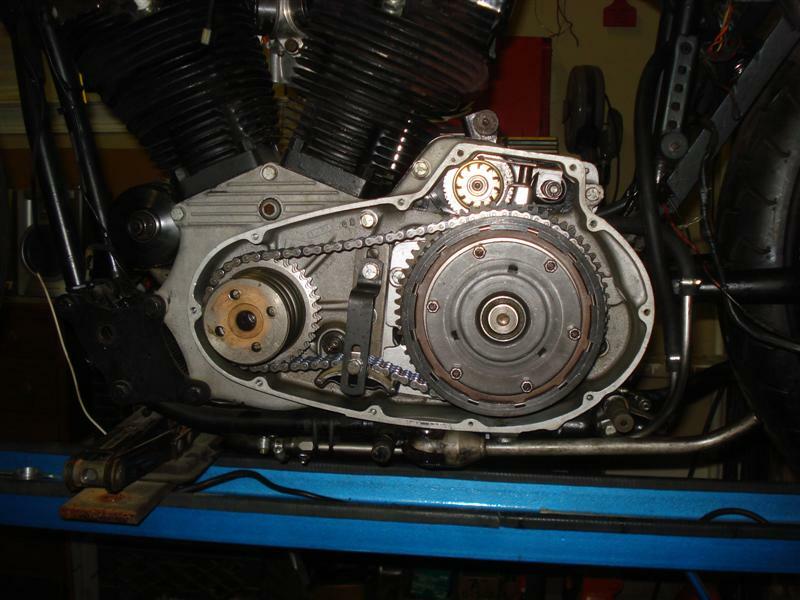 Sportster bendix gear replacement requires removal of the starter motor on the right side of the bike and the primary cover on the left side. Aside from being 100-year-old technology (Model-T Fords used them), the bendix-style starter drive on your old Harley has several drawbacks. The starter can still spin without engaging the flywheel, or it can jam during engagement. And if the engine kicks back while you try to start, it forces the gear to turn backward, damaging it. 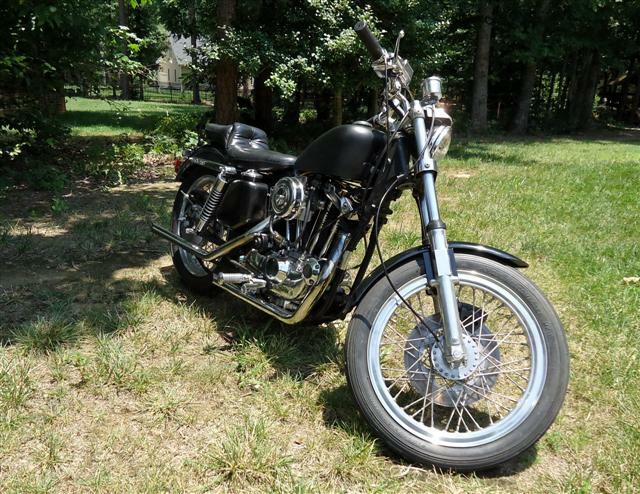 On several-year Sportsters, including the 1976 XLH I rebuilt, the primary chain and clutch assembly also need to be removed to replace the bendix gear drive. There are many more steps necessary for this, and specialty tools are required. A service manual is helpful. Think of a bendix gear as a hand-tool ratchet. It can rotate freely in one direction and lock itself in other. This allows it to rotate one way to start the engine when engaged, and then free itself once the engine starts. 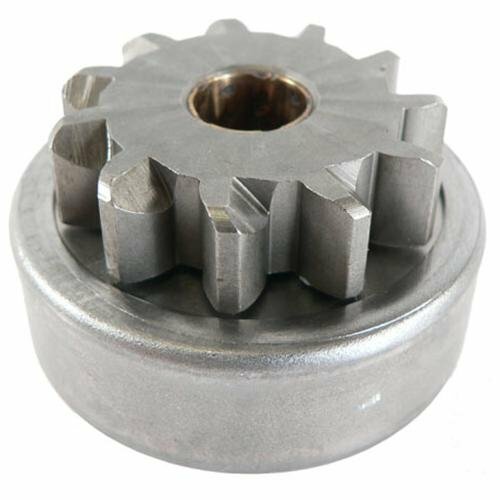 Many suppliers offer the bendix gear for your bike. The same part fits Harley-Davidson big-twins and Sportsters from 1965 to 1988. The primary cover and clutch assembly need to be removed. See clutch removal page. The primary chain, compensating sprocket, and clutch shell need to be removed. See primary chain removal page. On the right side of the bike, remove the gear-case cover. Remove the cable from the starter motor terminal. The starter motor is removed with two long bolts. 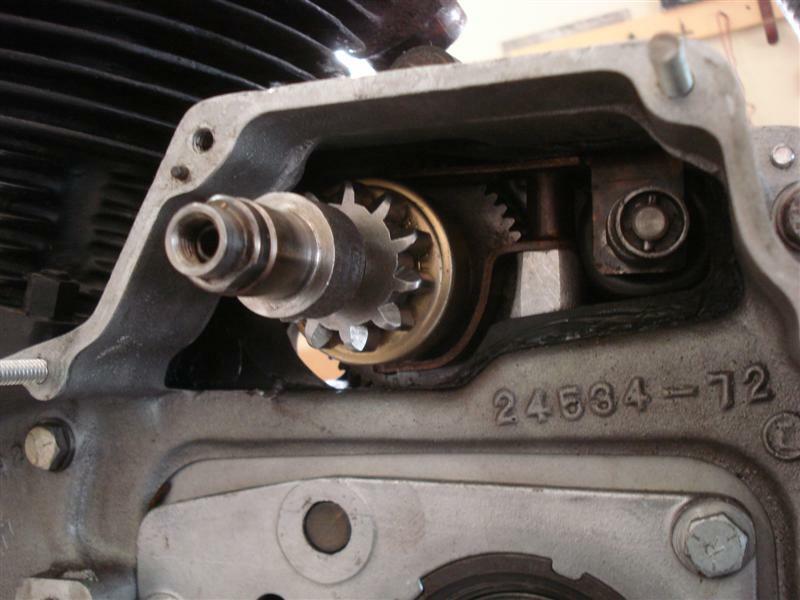 The pinion drive assembly is on the inside top of the left engine case. Depress the retainer cup, remove pin from hole in plunger shaft. Remove the spring. Remove attaching bolts. The fork that holds the pinion gear assembly in place is called the starter pinion lever. Rotate this until the fingers clear the pinion gear shifting collar, then remove. After you have the pinion gear assembly off the bike, place it between copper jaws in a vise. Tighten only until its snug. The pinion shaft is left-hand thread. Let me repeat this, the pinion shaft is left-hand thread! Unscrew the nut from the shaft. 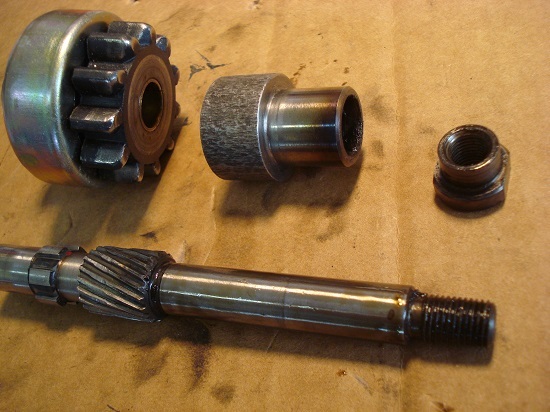 The pinion gear assembly in order of disassembly is the nut, bearing race, pinion and shifter collar. Remove the lock ring to separate gear and shifter collar. 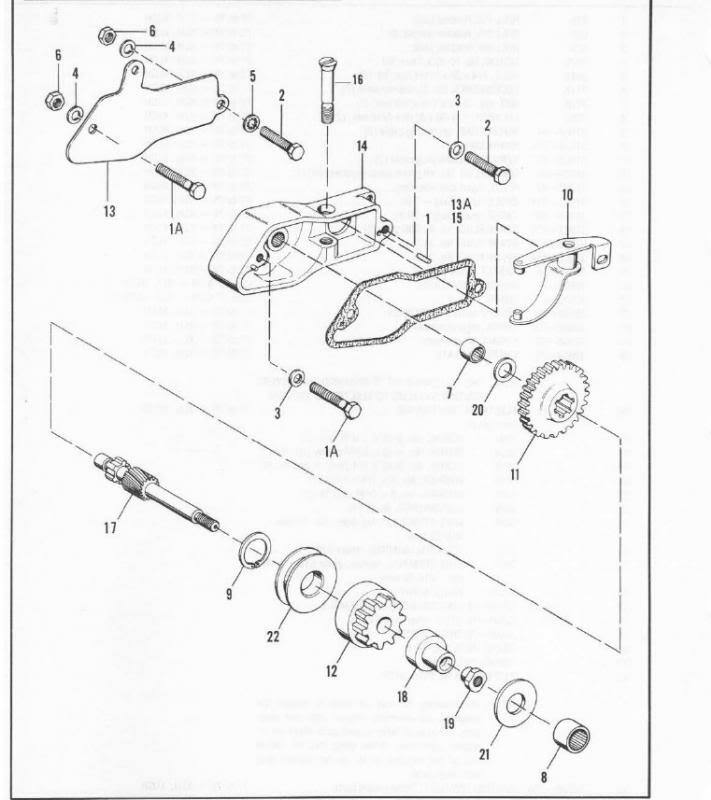 Disassembled, the pinion gear assembly looks like the picture below. Put a dot of thread-locking sealant on the shaft nut when reassembling the bendix gear assembly. Spin the assembled shaft in the bearings to check for free movement. Stake the starter shaft housing washer. Assembly is the reverse order of disassembly. Before you button up the motor, this would be a good time to replace your oil hoses.